Some nature in the middle of blocks. 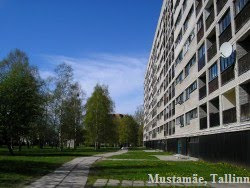 The building of city-government of Mutamäe, in front of my house (100m on the right, not visible). Such an amazing row they've done here! Nice! I made a picture of my own house where I moved in four months later, but in that day I had no clue of moving. It was my first time in this area. It was God's answer to my prayers that I could move and into this nice place. One of the best views! Now it is in front of my house. One of the uniques, very beautiful, and old too. It has 7 doors! This unique one again. So beautiful! That's a typical school. So nice! And finally, it turned out that the shop was closed in that very day! Ahh... But I got a nice series of pictures!